Susanne Saville has over 40 years of experience in the field of beauty therapy and founded The Susanne Saville Beauty Clinic and School of Beauty Therapy in 1973, where Susanne was Principal until 1995. 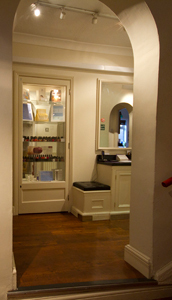 At the Susanne Saville Beauty Clinic we provide a relaxing, friendly environment together with the highest standards in beauty therapy. All new treatments and products are carefully researched and with our wealth of experience you are assured of the best treatments available by highly skilled, experienced and knowledgeable therapists. With over ten years of experience in IPL Technology for Permanent Hair Reduction for women and men, we are skilled and knowledgeable with this procedure. This treatment is carried out by Katie, Rose & Angie. We always ensure plenty of time for your treatment and you won’t ever feel as if your treatment is being rushed. We want you to have a relaxing, enjoyable experience whilst at our clinic and if you need anything extra such as more warmth, extra blankets, no music or anything else, you only have to ask. Consultations, although not always necessary, are an essential part of our work in order to carry out the correct procedures. Certain treatments may be contra-indicated if you start or change medication, therefore, we may have to make necessary adjustments to your treatment. We also ask you to follow carefully any verbal or written instructions given to you to obtain the best results from your treatment. We are proud of our reputation and we look forward to helping you soon.